North Carolina's Senate Finance Committee is poised to take away the right of communities to decide for themselves if building their own broadband network is a good idea or not. If it passes out of this committee, it goes right to the Senate Floor and will likely become law. We have covered Time Warner Cable's bill to kill community networks in greater depth than any other story -- and now folks in North Carolina have to immediately contact their Senators to oppose this power grab from big companies like TWC and CenturyLink. You can also use this form from Free Press if you are unsure who your Senator is. In recent weeks, we've posted excellent speeches from legislators opposed to the bill, testimony from concerned citizens, and a variety of resolutions from local governments who are fearful of this bill's impact on public safety networks needed to keep residents and businesses safe. If you are shy, you can call before or after business hours and leave a message on their voicemail. It takes less than five minutes. Your calls make a huge difference because so few constituents ever call state legislators. 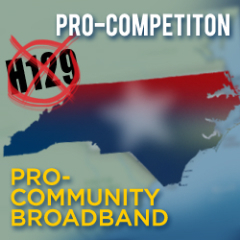 Simply let them know you oppose H129 and that the state should concern itself with expanding broadband access, not restricting who can offer it. And as I have said numerous times, those outside North Carolina should also be contacting their elected leaders -- because everyone lives in a state where powerful lobbyists are trying to preserve and expand the power of a few massive companies like Time Warner Cable and AT&T. Progressive States Network recent covered this topic. Two weeks ago, I wrote the following op-ed for The Wilson Times, which is behind a pay-wall. Time Warner Cable has convinced North Carolina’s House of Representatives to greatly restrict the authority of local communities to build their own broadband networks. Its legislation, H 129, is now being debated in the Senate and will enact a host of special regulations for publicly owned networks that do not apply to networks run by the cable and phone companies. The “Level Playing Field / Local Gov’t Competition” bill could more appropriately be called the “Monopoly Protection Act.” It creates special provisions to disadvantage public networks – like Wilson’s Greenlight and Salisbury’s Fibrant – that offer superior services compared to Time Warner Cable and CenturyLink. TWC has convinced many Legislators that a massive $18 billion/year company operating one of the largest telecommunications networks on the planet, is powerless to compete against networks built by a few small towns. Bill sponsor Representative Avila has simply had enough of “predatory” (her word) local governments shaking down AT&T and TWC. The champion of a similar bill last year, Senator Hoyle, candidly admitted it was written by TWC and there is no reason to suspect anything has changed. The state of North Carolina’s broadband? Terrible. The FCC has just released a report showing the Tar Heel state has the absolute lowest percentage of households with access to the Internet at minimum speeds identified by the National Broadband Plan as necessary to take advantage of modern technologies. When Broadband.com launched its new map showing the prices paid by small businesses for broadband, seven of the ten most expensive cities were located in North Carolina. Anchorage barely beat out Greensboro for the highest average price per Mbps. This is why major private sector companies like Google and Intel have gone on the record opposing TWC’s bill. With most of the businesses and citizens in North Carolina being left out of the digital economy, what is the Legislature’s response? The first priority is a bill long pushed by anti-competitive companies to limit who can build the broadband networks necessary to keep pace with the world, or at least neighboring states. Fast, reliable, and affordable access to the Internet is essential for communities to thrive in the modern age. This realization led Wilson and Salisbury to build their own globally competitive networks, which offer the best available connections in the state. Companies like Time Warner Cable and CenturyLink have neither the capacity nor willingness to make similar investments. They require a fast shareholder return on their investments. But next-generation networks take many years to break even – it is simply more profitable to continue offering last-generation DSL and cable services to residents and businesses who have no other choice. In short, these companies are more accountable to Wall Street than Main Street. They lobby the Legislature rather than invest in next-generation networks, while making absurd claims that no community has succeeded in building its own broadband network. They know legislators will not bother to call Bristol Virginia Utilities to learn the story behind their profitable, job-creating, network – just one of many. BVU’s infrastructure investment attracted hundreds of private sector jobs offering salaries at twice the median wage. Being publicly owned, the network profits are reinvested locally, offering more bang for the buck. When pressed on specific examples of community network failures, TWC and its allies may cherry pick a few that have legitimately struggled, out of over 130 citywide publicly owned networks. They may cite operating losses from networks only a few years old, conveniently omitting the fact that all networks have operating losses in early years. The business model for building a citywide next-generation network calls for massive up-front expenditures long before revenues begin rolling in – they are not expected to break even for 3-5 years at the earliest. The track record of community broadband networks is overwhelmingly positive, which is why these few massive companies work so hard to preempt them in state legislatures. This bill carves out unique barriers for publicly owned networks, such as restricting where they may offer services, a dramatic reversal of the Legislature’s approach to privately owned networks: reducing regulations on where they offer services. TWC and other private companies can offer loss leaders to bleed community networks of revenue but community networks are subject to strict price regulation from the state. Nonprofit networks will be compelled to pay taxes “that would apply” to a private provider, ignoring that TWC routinely avoids paying its fair share of taxes. Supporters of this bill claim it only creates a few modest hurdles rather than being an effective ban. Of course, when these same voices successfully deregulated the cable companies a few short years ago, they promised it would usher in more competition and lower prices. Instead, North Carolina has fallen farther behind while businesses and residents have suffered with numerous rate hikes. Legislators should do what is best for the vast majority of businesses and citizens of North Carolina, preserving the ability of communities to decide for themselves whether to build the networks necessary for future economic development, education, health care, and a high quality of life.